Hello everybody! 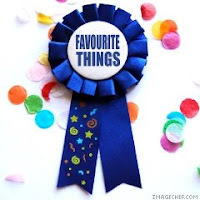 Thursday is around again with Favourite Things Thursday hosted by our friend Blue! Many of my favourite things have to do with food. What can I do? And if there's something I call a favourite is this peach frozen pie. It's my late sister's old recipe and I simply adore it since childhood. Sometimes I want to hide it into the fridge so only I will eat, so good it is! LOL It's like an ice-cream. 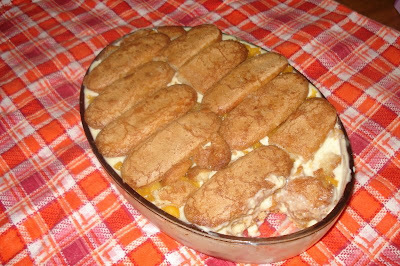 It's funny because I don't like peaches but in this recipe I lick my fingers... and the bowl! Take 3 cups of milk, and dissolve 3 tablespoons corn starch in it. Add 3 yolks plus 3 tablespoons sugar. Stir well and take it to the stove, stirring until it thickens. Let it cool and add 1 can of sweet condensed milk plus the same measure of heavy cream, mixing well. Spare it. Shred well 1 can of peaches, saving the syrup. Finish with a layer of ladyfingers. Take it to the fridge until serving. I like it frozen to hurt my teeth! Wow, that's very cool! I have never heard of this before. It's like a frozen version of triffle, yummy. I will have to try this, thanks Nydia! That looks really good. I like peaches, but I don't eat them often. This might be a good reason to go buy some! Sorry, I'm as ever late commenting here & that no other Fav. Thing participants visited either. I think my meme's dying a slow death, but glad that you've played again. YUM!!! I have already copied and pasted and printed!